8th OLD PRAGUE HAM in JUNE 2017 was great ! XV sans Q (France) : Thank you for this very well organized tournament with a very good rugby games. We had a great time in your city. The muscles are tired but the head happy !! see you soon !! Hamilton Dynamiters (SA): Thank you and your colleagues for a really well run and stunning tournament – on the field and off the field. We have had one of the best tours ever and we do lots of touring so well done and good luck with you future tours. Datas for 2018 were selected ! 9th OLD PRAGUE HAM will be held on June 08 – 10, 2018 ! Let me invite you to our tournament 8th Old Prague Ham which will be held in Prague in June 8 – June 11, 2017. 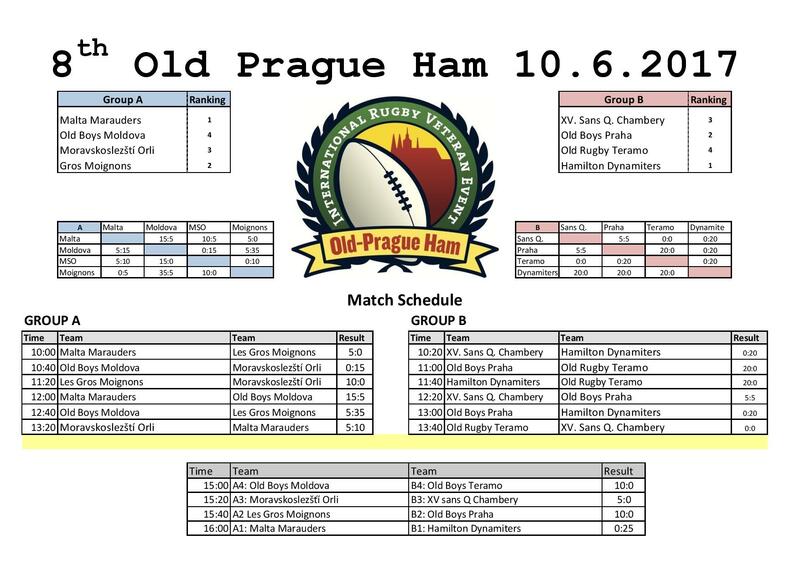 Come and enjoy great old boys rugby tournament with unbeatable UNLIMITED BEER CONSUMPTION as well as the beauties of Prague with its famous nightlife. – Malta Marauders – finalist of 2016 edition coming again ! We are looking forward seeing your team ! The DYNAMITERS – the veteran team of HAMILTON SEA POINT RFC, the oldest club in SOUTH AFRICA is the 1st team booked for 8th OLD PRAGUE HAM in June 2017 ! Come and join us with your team ! The dates for 8th OLD PRAGUE HAM 2017 are June 08-11, 2017 ! All teams are welcome ! UNLIMITED BEER CONSUMPTION during parties and game day will be also in 2017 !